A private lakeside resthouse in Laguna with watersport facilities. 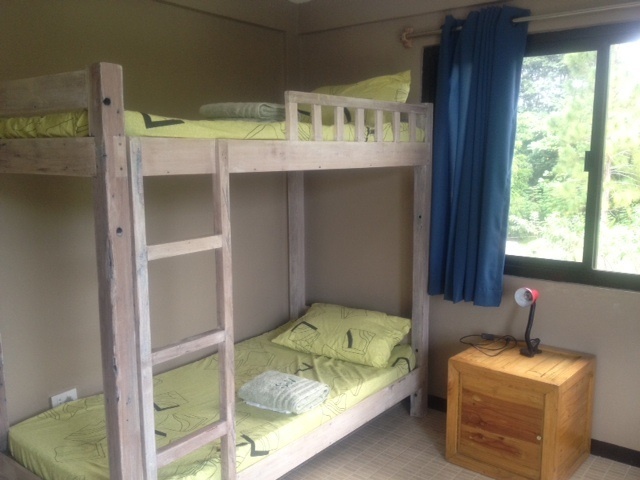 Our rooms and campers are fan-cooled, and are additionally cooled by the mountain breeze of Lake Caliraya, with clean and communal bathrooms for our guests’ use. Temperatures are typically 4 to 5 degrees cooler than in Manila. We strive to have the rooms and rental campers available by 1:30 PM for guests staying the night. On the day that you are leaving, please vacate the rooms/rental campers by 12 noon so that the staff can prepare the room for subsequent guests. Guest who have cleared the rooms may still use the clubhouse and bathroom facilities, and may still purchase food and drinks from the kitchen. Habagat A has two twin beds, and a pull-out trundle. It sleeps three, and its windows face north and west. Guests staying in this fan-cooled room may use the communal bathrooms (separate men’s/women’s bathrooms with multiple stalls), which have hot water. All rates are exclusive of 12% VAT and 10% service charge. A limited number of tents are available for rent. The 3-man tent sleeps 3 persons maximum, and can be rented at Php 1,900 per night. The entry fee is waived for 2 or 3 persons, depending on the tent size being rented. All rates are exclusive of 12% VAT and 10% service charge.